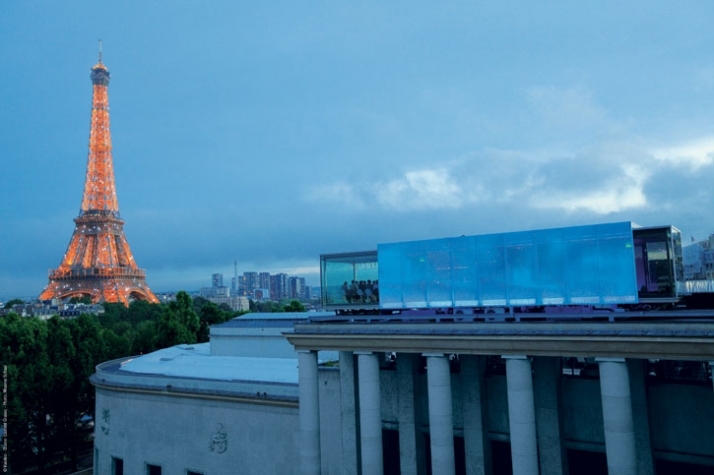 It’s one thing to have dinner on le Tour d'Eiffel while looking down at breathtaking Paris, and another to have dinner on Art Home or as our friends the French would say “arome” and have breathtaking views of Paris and unobstructed views to the Tour Eiffel! We at Yatzer prefer the second! 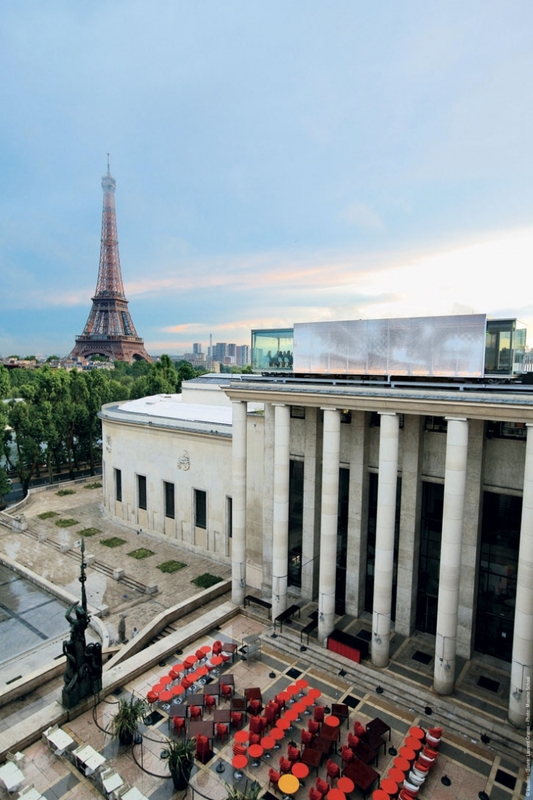 Especially, since Art Home is a restaurant which has been temporarily placed on top of the Palais de Tokyo with the assistance of a crane (video follows). 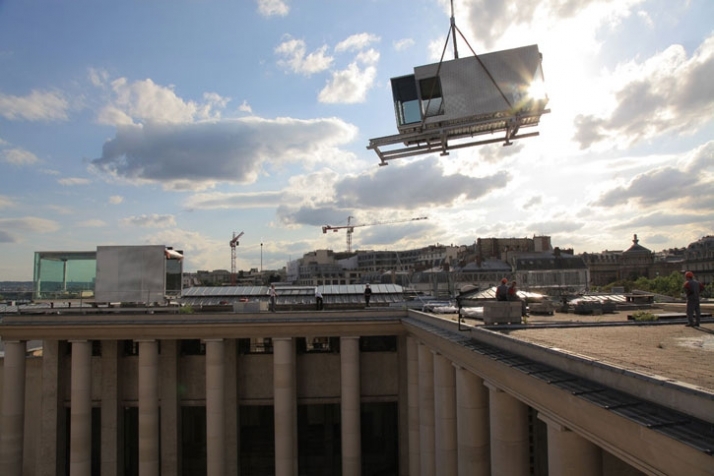 And yes, all you faithful Yatzer viewers do remember correctly, you’ve seen this before on Yatzer as it’s the second time that an installation has been placed on top of the contemporary art museum of Palais de Tokyo. 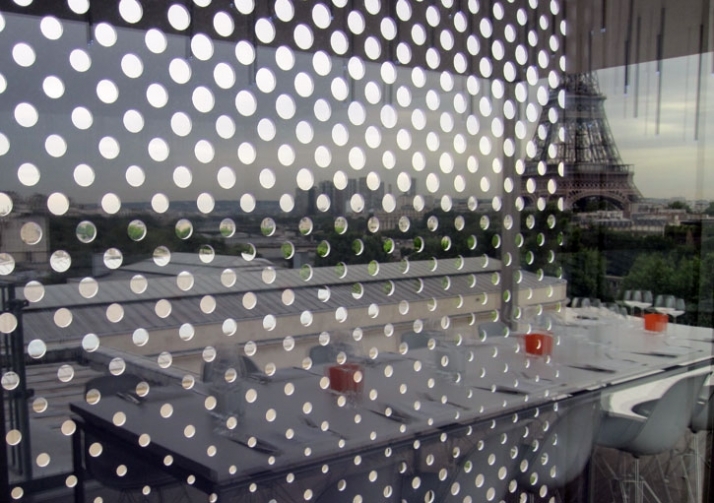 The first installation was the Everland Hotel in September 2007, a project by Swiss artist-duo L/B Sabina Lang and Daniel Baumann. Everland Hotel had a single room which provided an exclusive travel experience for two people; it included a deluxe bathroom, a king-size bed and a lounge. However, as of July 1, 2009 Art Home or Nomiya was launched with a common ambition: to create memorable experiences around food. 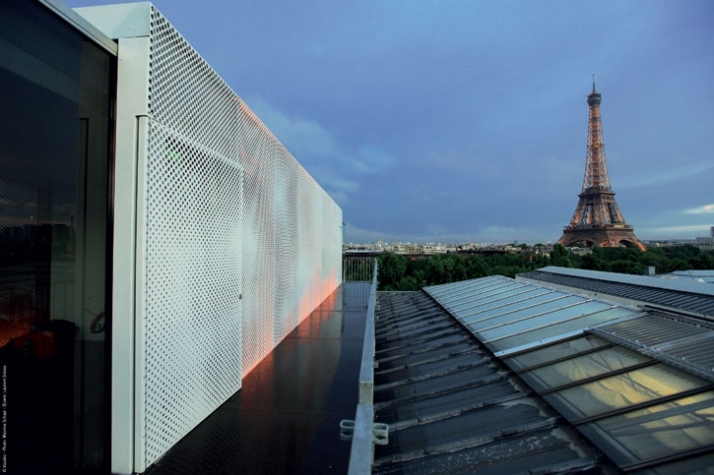 Multiple artists, with the assistance of Electrolux, and Palais de Tokyo contemporary art center who envisioned this common passion joined their forces with contemporary French artist Laurent Grasso and culinary director Gilles Stassart. And voila, a creative journey around culinary art was born! 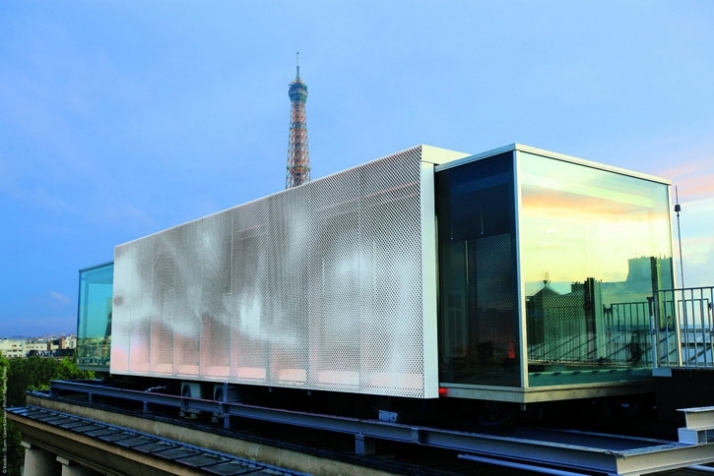 In the creation of Nomiya, Laurent Grasso was assisted by his brother, Pascal Grasso, an architect. 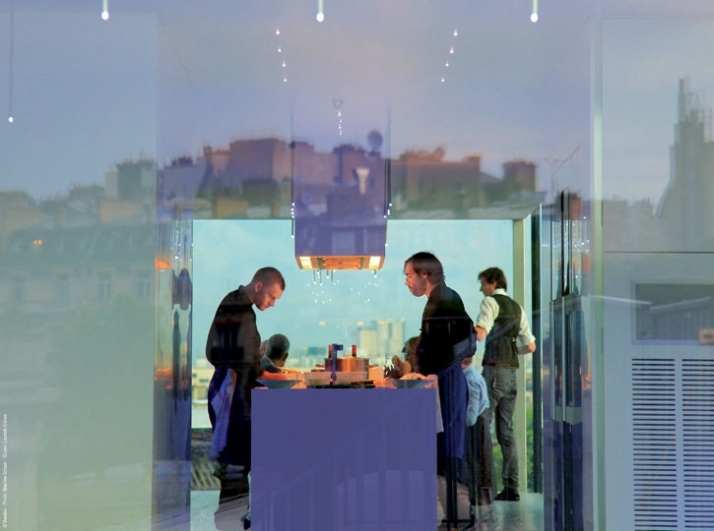 With architectural limitations this installation only houses a dozen of people either for lunch or for dinner. 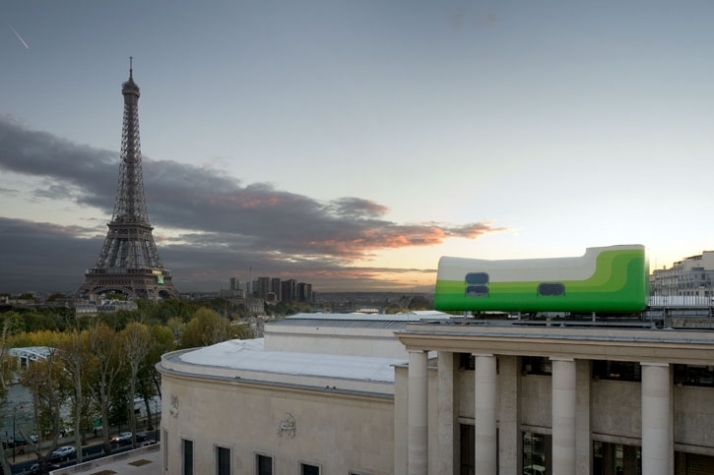 So given the few seats and the limited period of time that the installation will be there, reservations is a tough one! 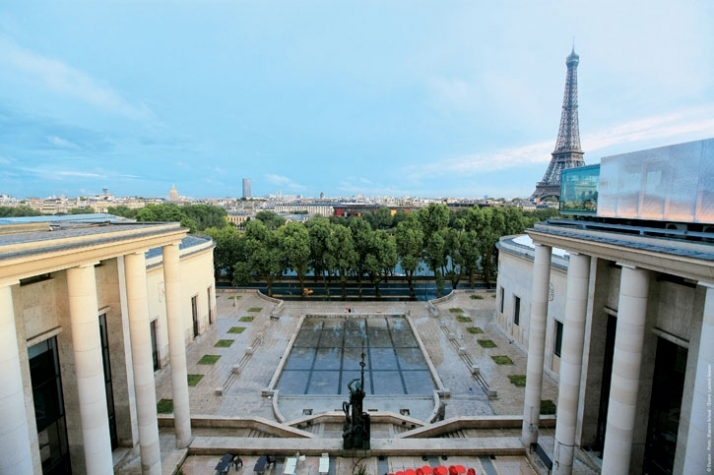 If you are curious to see the Art Home installation free tours are conducted daily between 3 and 5:30 p.m. (except Mondays, when the museum, restaurant and tours are closed), with online reservation required. Laurent Grasso creates environments that combine atavistic fears, scientific evidence and ominous contemporary mythologies. His works are in ways reminiscent of the paranoid retro-futuristic prophecies of Charles Fourier two centuries ago. Light, sound, radio and electromagnetic waves, natural, paranormal and meteorological phenomena are regularly incorporated to create new sensory experiences. 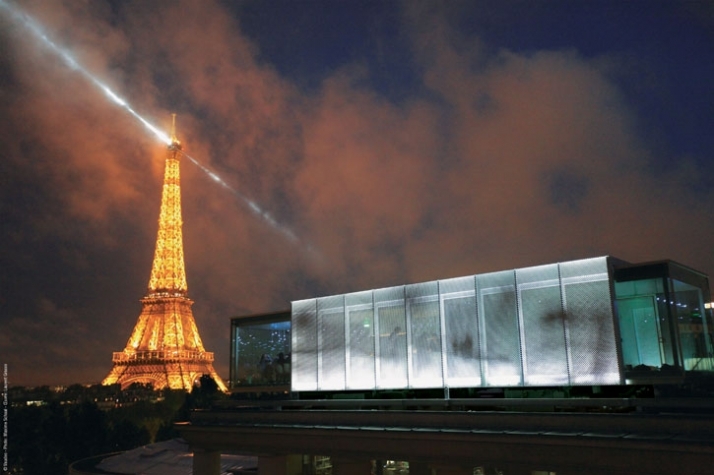 Art Home is a two-piece installation created by steel and glass; it was prefabricated, brought to the site, and placed by means of a crane on top of the museum. The construction is simple and light, and ties up well with the existing building due to its shape and color. The lighting installation is magnificent at night and bonds well with the surrounding environment. Eating at the Art Home seems like a homely and cozy experience as the kitchen is in the installation and the food is prepared before the eyes of the client. Whereas, the lucky dozen eat in one table! 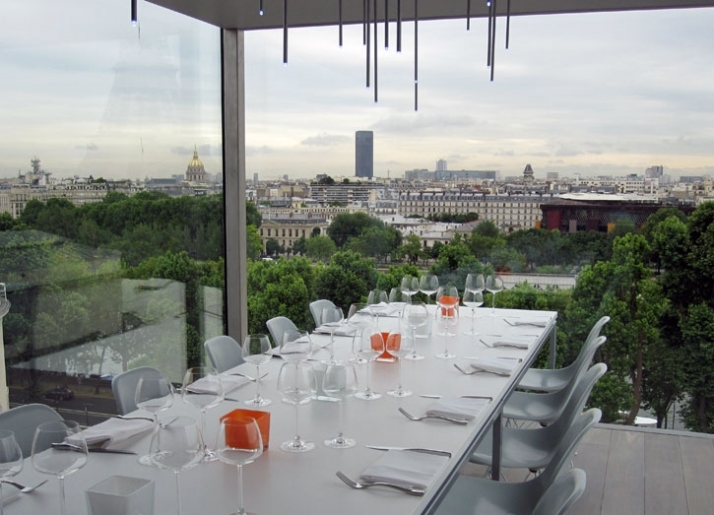 Modern chic Parisian lunches and dinners for lucky city chic people! Art Home on Palais de Tokyo // 13 avenue du Président Wilson // 16th arrondissement.